Storytelling in the business setting is a dying art – and that’s a terrible shame. But we have become slaves to PowerPoint, charts, dot-points and theoretical lenses. My guest in this episode wants to change all that. 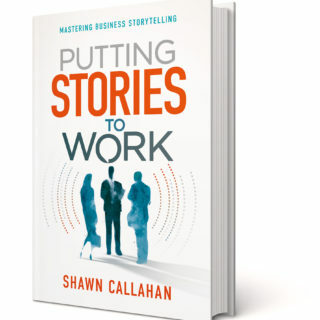 Shawn Callahan is a storytelling consultant. He talks us through the benefits of telling great business stories and he steps us through a process that will help us all be better storytellers. And, you guessed it; Shawn is a great storyteller himself. He brings to life all of his insight and advice with the use of powerful, memorable stories. Hang on to your hats – once you listen to this episode you will never see business communication the same way again. As a story-telling consultant Shawn does not feel pressure to be a great storyteller – but he does feel pressure to actually tell stories. He has listened to so many talks in which presenters share wonderful information and data – but fail to share enough stories…or any stories at all. Subsequently, they lose their audience. In trying to explain tacit capability – the things you can do but cannot explain – stories become a key element. It was working in this space within the field of knowledge-management that got Shawn really interested in the benefits and art of storytelling. In his early stage of his storytelling career, Shawn met a guy who had the ability to speak all day with nothing but a flipchart and marker and the audience hung off every word he said. In breaking down how he managed it, Shawn realised that every time he would make a point he would tell a little anecdote that supported it – this is what had such a powerful effect on the audience. 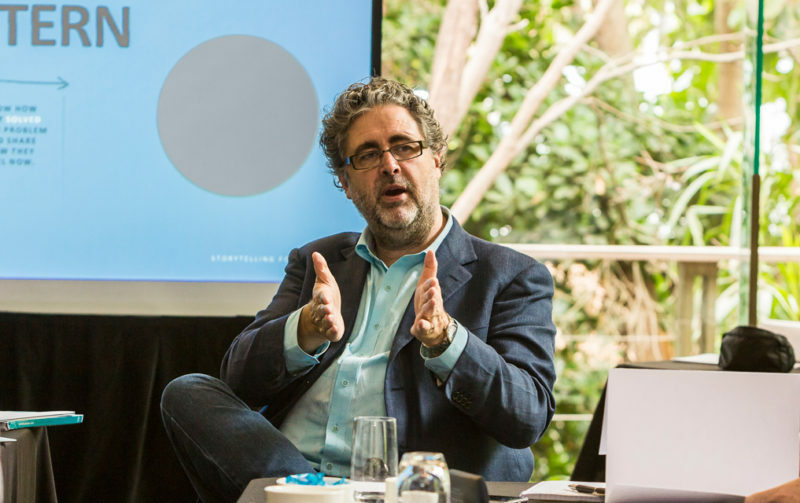 Shawn started his business Anecdote to help organisations and leaders to find and tell their stories because he had noticed the humanity sliding away from business. Why Should I Tell Stories? When presenting to an audience in a formal setting, people often get caught up in showing great data, through the best consultant lenses, but ignore obvious opportunities to tell great stories that will have the effect of bringing to life the points they are making. Stories are 7 times more likely to be remembered than argument, facts, data, graphs…etc. Good stories tap into experiences and emotion. When you tell a really interesting story, the audience begins to anticipate what is going to happen next. Scientific testing has shown that the pattern in the brains of the audience begin to mimic the brain pattern of the storyteller. What a great way to engage your audience! Stories have to have a business point – it’s great to find colourful, interesting stories that are all around you – but they are useless unless they make a relevant point. Story telling is important for leaders in an organisation because it inspires action. By evoking emotion, leaders create a greater connection with their colleagues. Mostly people aren’t inspired to action through rationale and data, they have to have a feeling. So telling emotion-evoking stories is so much better than sharing numbers and evidence. We almost always base decisions on our own experiences – so if you can’t give people a firsthand experience the next best thing is to tell them a story that gives them that experience vicariously. How do I Tell Great Stories? When you develop a desire to tell more stories, the first step is to begin finding them – to spot them in the wild. And you soon learn that they are not beautifully crafted, Hollywood pieces of work, they are short and sharp with concrete details – but most of all they help you to see a picture. It taps into our very powerful visual memory (that’s why stories are 7 times more likely to be remembered than data). The best stories are the ones you can tell off the cuff – insert them into a conversation or presentation when they are required. Natural and relevant. You have to practice telling your stories – so that you fine-tune the delivery and so that they are locked in to your memory, ready for release at the right time. Shawn thinks that once you tell a story three times it’s usually locked in to your memory. We should try and tell small ‘S’ stories – anecdotes. Rather than Big ‘S’ stories – which replicate Hollywood storylines, usually centred around a complicated hero plot structure. In a business setting it’s powerful to tell a story first and then present facts/argument/reasoning/plan to support the story (or stories). Not the other way around. Influence – to tackle stories within the organisation that are causing you pain (often they come in the form of anti-stories). To help change people’s mind. You can’t beat a story with fact. You can only beat a story with abetter story. These are the four basic patterns of stories, but there are many more story types.